Gemtor Davit and Quadpod non-entry confined space retrieval systems come complete with everything you need to enter a vertical confined space with an acceptable means of access, except a full-body harness which should be selected based on application needs and user preferences. The davit’s permanent base can be mounted to steel flooring or concrete, or on the back of a truck and is especially useful for tank entry or over edges. 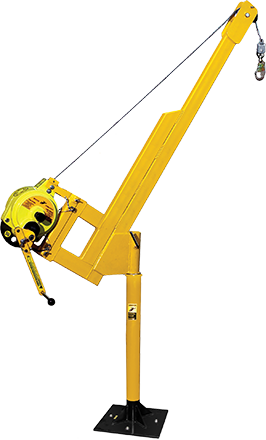 A removable boom that rotates 360º easily attaches to the base and can be locked in any position to offer flexibility for maneuvering equipment or a worker. Additional bases can be ordered (see below) and one or more booms can be moved among many permanently installed (QP-B) and/or portable (QP-L) bases. 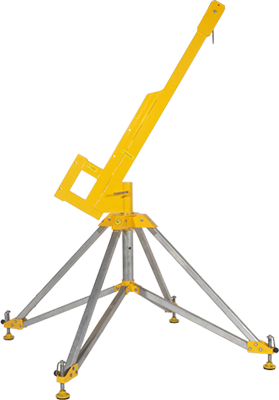 Height 89″, Reach 26″, Tested static load 5400 lbs., Working Load 310 lbs. Ideal for situations where the use of a tripod is either impractical or impossible. The Quadpod is easy to set-up and collapse and each leg is independently adjustable to compensate for uneven terrain. The removable boom rotates 360º and locks in any position. Quadpod and Davit components can be used interchangeabley. 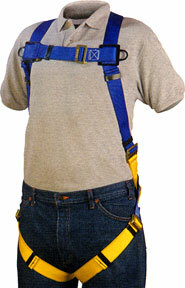 Height 90″, Reach 26″, Tested static load 5400 lbs., Working load 310 lbs., Distance between legs 54″. a worker from falling and has an integral winch mechanism that allows a worker to be raised to the surface quickly and easily. Attaches to any Gemtor Tripod, Quadpod, or Davit with quick-insert locking pins or can be hung from overhead using an optional carabiner. Features include a large, rubber-coated knob which makes engaging and disengaging retrieval mode an easy, one-hand operation. Precision internal components and a strong, weather-resistant cast aluminum housing ensure reliability and dependability. 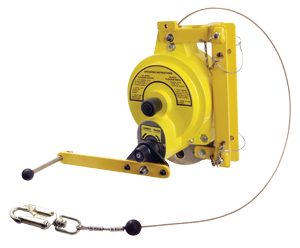 The Model # RS3 has two independent braking systems: an energy absorbing centrifugal brake arrests a fall softly within 24″; a friction brake activates immediately when raising or lowering is stopped and holds the load in place.The unit is supplied with 3/16″ diameter galvanized or stainless steel cable lifeline in 50′ or 100′ lengths and has a permanently attached locking swivel snaphook for connection to a full-body harness. 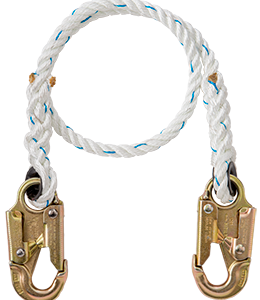 Model # RS3-50 50′ of galvanized steel cable, 45 lbs.Model # RS3-50S 50′ of stainless steel cable, 45 lbs.